Trying to record an external synth, using Buzz as a sequencer. Windows 7 64-bit. The synth is connected to line-in on my computer, and when I send it notes via Polac loader, I can hear it working (because I have "listen to this device" selected in the Windows sound control panel). However, no signal is shown within Buzz. I think it may only be listening to FrontMic input. 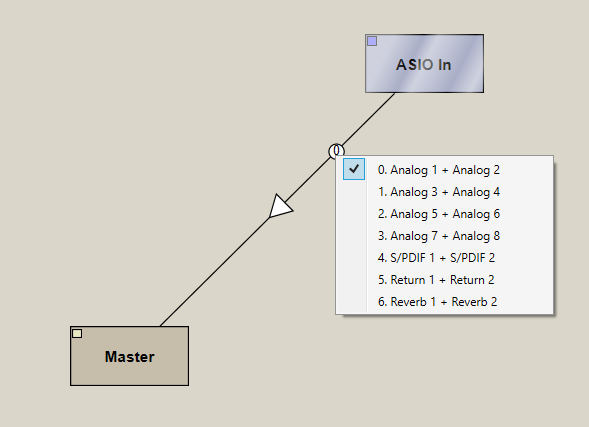 I know at one point in the not-too-distant past I was able to use the FrontMic with Polac ASIO In - now the question becomes, is there a way for Polac ASIO In to listen from the line-in instead, so I can actually record the audio? Did you try to change the channel on the asio input machine(click the "dot" on the connection). And be sure to use the latest "audio in" machine from the pvst package, the old Polac ASIO In machine is not compatible anymore. If by the "dot" you mean the triangle, clicking it just gives me the standard mini-mixer screen. I'm also experiencing a lot of instability with ASIO, which might be better in a separate thread - I'll post in more detail later, but short version is after a certain amount of time (less than five minutes, usually) it disintegrates into a mess of clicks and distortion regardless of buffer size or latency. Switching buffersize (or increasing, but not decreasing, latency) while it's a clicky distorted mess will immediately "fix" the problem, but it will happen again within a couple minutes. Anyway, I "solved" (sidestepped) the issue by finally upgrading to a standalone audio interface. For anyone wondering, the Behringer UMC204HD is the real deal. $80 and comparable S/N ratio to interfaces four times the price. About the only qualm I have with it is that the headphone out is a bit hissy (especially when listening to the live input/monitoring - probably an internal circuitry issue. Main out is fine though). It also has its own ASIO driver, which - at least for me - works a lot better than ASIO4ALL (ASIO4ALL seems to be one of those things that either works like magic or completely does not work like magic).